Kevin Aucoin… Many may not fell familiar with this brand. It has only few stores. So it’s hard to find. I tried some Kevyn Aucoin products, but I forgot to post them. I have much to post…. 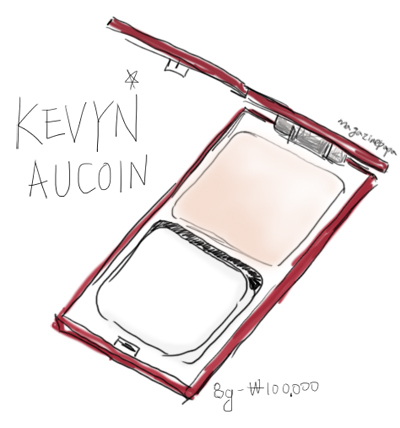 My first impression about Kevyn Aucoin was… unexpectedly fine quality. And the unbelievable price that makes me think about how much I spent last month. It applied also to Dewdrop foundation. How this can cost $ 85.66? Many friends agreed with my opinion. It feels just like Benefit Some Kind-a Gorgeous. it’s creamy and changes soft at the moment it touches skin. Powdery and light finishing touch is noticeable. It’s definitely powdery, but not matt. The skin doesn’t feel tight. But the price is over the Gorgeous. In point of only the quality, I would select Kevyn Aucoin Dewdrop Powder Foundation. doesn’t care much about the price,I would recommend Dewdrop Foundation. Dewdrop foundation’s color is way more natural than Gorgeous Lite or Original. It’s better in covering, either. It makes the skin bright and covers blemishes well. Kevyn Aucoin said full-cover is possible, but I don’t think so. I mentioned about the covering of Gorgeous Original. If chosen according to the skin tone, Dewdrop covers as well as Gorgeous Original. So be specific, it covers little blemishes and small pores on nose and front cheek. Gorgeous Lite doesn’t cover at all. If you apply Gorgeous Original many times, the covering get better but the skin tone gets darker. So, this is the difference. You can use either sponge or foundation brush. If you use sponge, the skin absorbs well and applies well. Also the sustainability is better than Gorgeous. I said that that finishing touch is powdery…but I didn’t mean that it’s soft all the time. The shine is less than general foundation, so it’s good for oily skin. People with oily skin who don’t like to apply powder and avoid too mush shine might like this. It’s also good for neutral skin, too. Just, I don’t recommend this to people with dry skin. Dewdrop and Gorgeous don’t go well with dry skin, especially skin with dead skin cell. For people with not that great skill, it’s hard to express matt skin. If your skin is not dry skin, or you are considering using Benefit Some Kind-a Gorgeous Light,please test this one. I think the price is really crazy. The company may have overestimated customers’ budgets. I want to ask them how they set the price. I want to try more Kevyn Aucoin products, but it needs much courage because of the price. The high price without any belief causes it to be pushed back by other products. I guess it’s hard for Kevyn Aucoin to settle in Korea. The quality seems pretty fine...But I doubt if it worth its price. This compact foundation is special in that it contains brush, not sponge. But well, it looks like a common cheap brush. Anyway, this one is definitely not a good one! As the brush is big, it has advantage of fast and light touch, but it doesn’t apply well. I tried a foundation brush and it was way better. Well, if one without a foundation brush is to buy this foundation, she might have to buy a brush. The case is also a problem. I don’t understand why they made this with thick glass on it. It can tear my bag. Even more, it doesn’t contain a mirror. I think a mirror is essential item for foundation. Like other Armani foundations, the covering gets better as you apply more times. I use #2 but I don’t fell bright. It seems impossible to get much brighter with this. It gives natural feeling rather than bright feeling. The finishing touch is not perfectly soft, but it’s not sticky. It’s not a moist one, but it’s also not a dry one. It’s easy to fix makeup only if you apply well first time. So it makes nice brush essential for nice makeup. Its sustainability is fine and the covering is good compared to other compact foundations. But it feels heavy. You will find another sponge or brush. It’s a compact foundation, which is powder type, not cream type. My country doesn’t have much of concept of powder foundation. Most apply powder above cream or liquid foundation. Of course, it’s not a fault. It has advantages in covering and sustainability. But if you don’t need great covering, you don’t have to use this method. If you don’t have much blemishes, powder with fine covering is enough. I’m thinking of posting compact foundations for a while, and most of them are cream type. So I prepared a special one for people who has oily skin and who wants light makeup. I’ve been considering of effective use of powder foundation and finishing feeling better than Gorgeous. 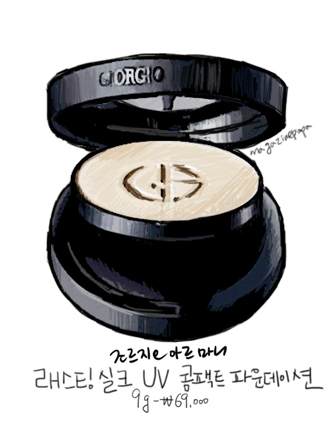 So I picked, Giorgio Armani Lasting Silk UV Compact Foundation. As you might know, I don’t use powder. Well, I don’t like all powdery ones. As I get older, I came to like moist ones. From toner to blush, shadow, highlighter, I use only cream-typed ones. But this Giorgio Armani Lasting Silk caught my eyes. It’s a powder, but it’s like a foundation. It feels soft and not dry. It’s unbelievable that it’s a powder-typed one. The smooth feeling felt with finger tip is great. You can feel the difference with finger tip. So, it applies smoothly on skins except for ones with too many troubles or rough skins. It covers better than common powder. The covering is even better than Gorgeous Lite. So this is how I use this. I have many blemishes, but I do makeup pretty lightly. Except for party or special occasion, I avoid thick makeup. I use it as a replacement of a foundation, not covering it over foundation. So after skin care, applying this after sunscreen is the end of my makeup. It applies lightly and covers blemishes. It prevents skin from being dry, while giving soft skin. It’s Benefit Gorgeous which made me determine to include this one in this posting. To be accurate, it’s for people who want the feeling of Gorgeous. This one does those jobs. As it’s compact-shaped, you can apply fast using a built-in puff. I usually use mini brush rather than puff, but with puff, it’s easy to finish makeup fast. 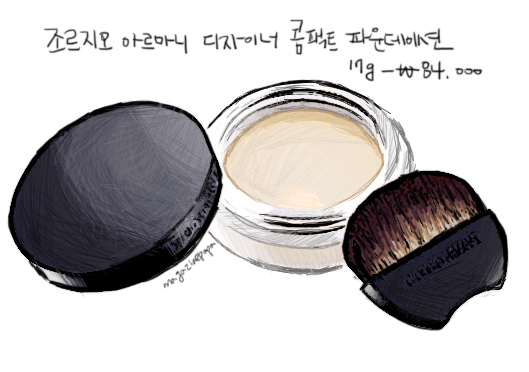 As I mentioned before, it’s a powder without dryness, let alone the light feeling. It’s SPF34/PA+++ which blocks both UVA, UVB. If you have much to cover, applying it with built-in puff would work. But if you want to express natural and light feeling, sweep with a brush after applying sunscreen. You would have your own taste, but I recommend my friends to use a foundation achieving both soft feeling and covering, not to cover it over foundation or BB. so I looked for some cheaper replacements, but there were no recommendable ones as these. I didn’t mean that cheap ones are all bad, what I meant was those didn’t satisfy me much. Also, it seemed to be a waste to invest money for ones which I won’t use. So my conclusion is this: Let’s try using our own products. Powder with covering, powder foundation, mineral powder…etc. Powder pact of cheap brand is also fine. Let’s do a light covering using ones which you use enjoys using.